While working on a census of over 300 cased objects in Library and Archives Canada’s photographic holdings, I discovered a hidden treasure. 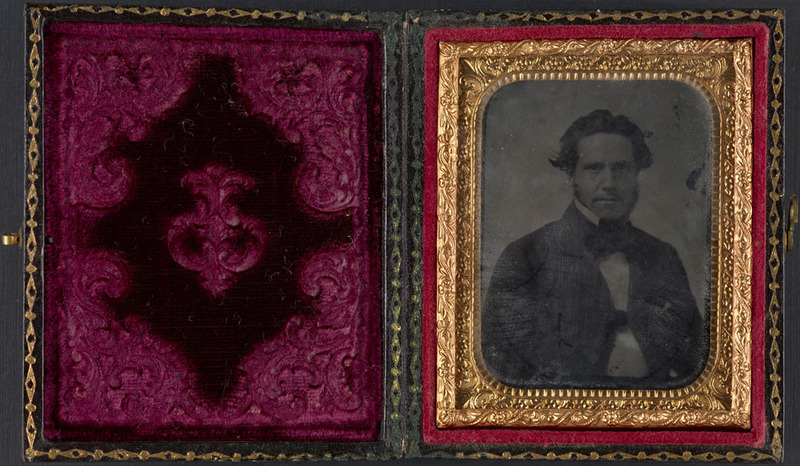 I noticed that one of the cased images looked a bit odd, as it did not resemble a daguerreotype, an ambrotype or a tintype, which you would typically find as the photograph in one of these small leather, paper or plastic cases. The questions began: What is this? What photographic process was used to create this object? The first clue that I was dealing with something different came when I noticed that the item was unsealed, meaning that there was no original sealing tape. Historically, paper tape was used to seal the package found within the cased object, for various reasons. But there was no indication of any original tape, so with no tape to disturb, I decided to open the package. Immediately after removing the package from the paper case, I noticed a piece of thick card attached to the back of the package. This card appeared to be a leftover piece of paper. Handwritten in pencil in the top-left quadrant were some words that were partially cut off: “hol” and “acid.” There was also some sort of damage along the top. From the discolouration, it had to be a liquid stain. At first, I did not think much about the card. Since there was no longer any original sealing tape, someone might have previously removed the tape and placed a piece of paper behind the photograph. This finding was not unexpected, as photographic plates were often taken out of cases and the cases switched. Only later did I realize that the text was indeed vital to understanding the nature of the photograph. After I removed the card, I saw a piece of leather. I knew immediately what I was holding in my hands! 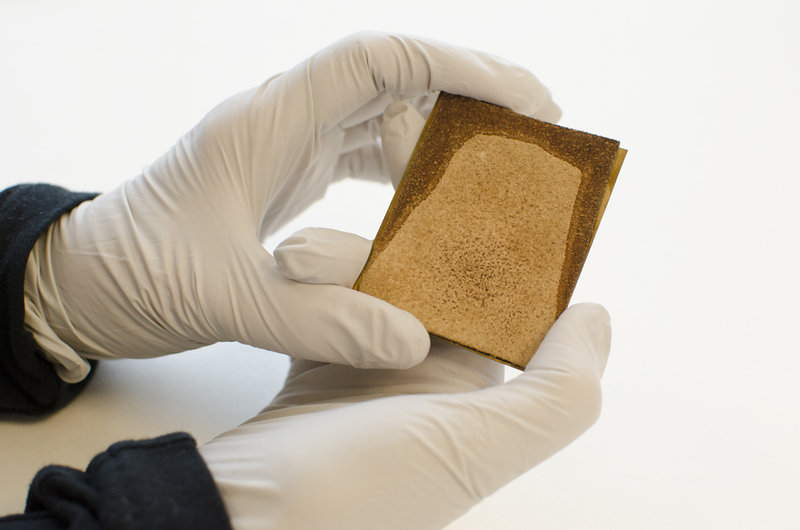 The leather was not another layer that had been added behind the photographic plate. This was an actual photograph on leather! This photographic process is called pannotype (the prefix comes from the Latin pannos, which means cloth). I had read about pannotypes and seen modern recreations; however, it is very rare to find originals, let alone for them to be in good condition. I turned the object over and removed the brass mat with its cover glass. And there, under the deteriorated and soiled glass, was a glossy leather surface with, in excellent condition, the image of a man. The deteriorated glass had distracted me and made me question the type of photographic process. Now, through my careful analysis and with an added dash of serendipity, Library and Archives Canada has an identified 19th-century pannotype in its holdings! Pannotypes were a bit of a trend between 1853 and the early 1880s. They were made by a method similar to that for ambrotypes. But instead of glass, a piece of cloth or leather was used as a support. What is interesting is that pannotypes were made by placing drops of a dilute solution of nitric acid in alcohol onto an existing ambrotype. 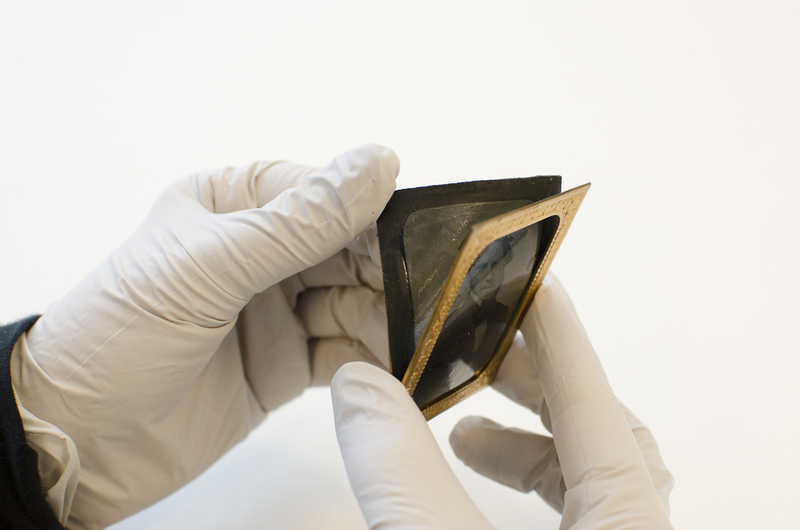 This was done to allow the photographer to remove the emulsion (which contained the actual image) from the glass support and place this emulsion onto a new support, such as a piece of leather. This brings me back to the handwritten partial words on the piece of paper that I found on the back of the leather, “hol” and “acid.” Could the words be alcohol and nitric acid: the very ingredients required to make a pannotype? 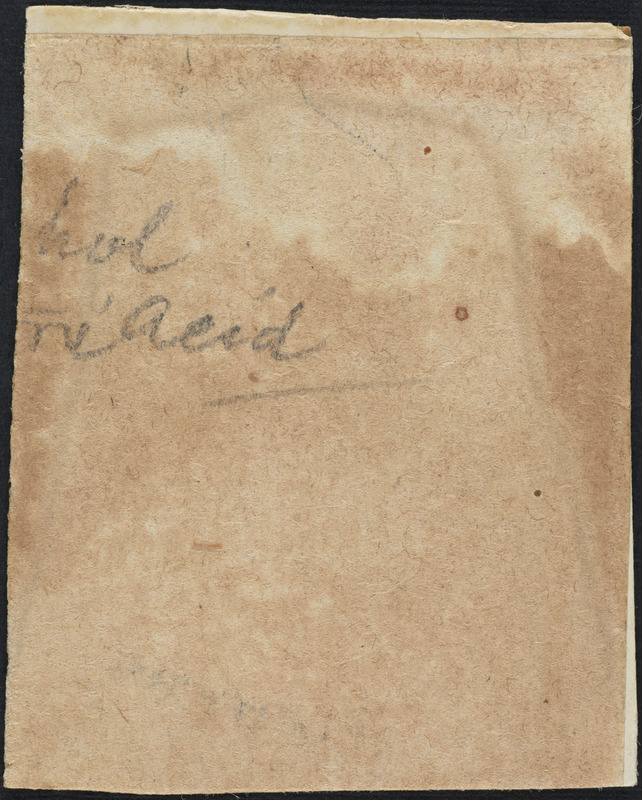 The paper found at the back of the photograph, with the text “hol” and “acid” written in pencil. This pannotype photographic process was presented for the first time in 1853, to the French Academy of Sciences by the firm of Wulff & Co. Instructions for the process were made available for sale by that firm for 100 francs. Pannotypes soon became generally known, with many professional photographers making commercial use of them, as evidenced in surviving advertisements and journal articles. Customers were interested in the process at the time because pannotypes were believed to be more stable, since they could not break because they were not printed on glass like ambrotypes, nor could they be easily scratched like daguerreotypes or bent like tintypes. We know very little about how the pannotype process was developed and practiced here in Canada, but we do know that there were several prominent photographers using this process, including George Robinson Fardon (1807–1886) from Victoria, British Columbia. His images of “Portrait and Views on patent leather” were sent to the London International Exhibition, 1862, and they eventually became part of the Victoria and Albert Museum’s holdings. Today, discovering a pannotype is rare, as their durability was very limited because of their inherently fragile qualities. However, the newly discovered pannotype is on patent leather and is in excellent condition. The only difficulty here is that the original glass in the brass mat had begun to deteriorate; however, following some conservation work, the problem has been fixed. Our next step is to share this information with the public, and perhaps to try and solve the next mystery: who is the man in the photograph, and who was the photographer? Stay tuned! Tania Passafiume is the Head Conservator of Photographic Materials in the Care of Collection Division of the Digital Operations and Preservation Branch at Library and Archives Canada. Shannon Perry is a Photo Archivist in the Government Archives Division of the Archives Branch at Library and Archives Canada. This entry was posted in Photography and tagged mystery, pannotype, panotype, Photography by Library and Archives Canada Blog. Bookmark the permalink. This discoverblog on pannotypes was extremely well-written and informative. For a volunteer archivist like me, this amount of detail allows me to understand the types of things that I might find from time to time in collections coming into our Archives. Though I have never found a pannotype, I have found daguerreotypes and of course tintypes and the more I am able to learn from a trusted source, the better my ability to preserve the artifacts that we receive. Thank you so much for this. Thank you for the wonderful comment! The staff expertise at Library and Archives Canada is truly astounding. I have passed along your kind words to the authors.